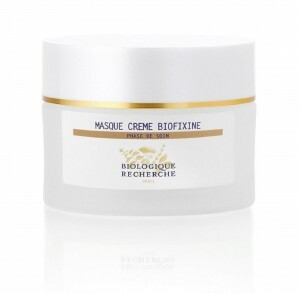 Masque Crème Biofixine is a smoothing and softening antioxidant treatment to fix, tighten and relax your every fine line and wrinkle. This creamy mask is formulated to improve elasticity and has a re-plumping effect. The grape seed oil and green anise extract will help fight free radicals whilst the white clay will purify and our BR oxygenating complex will bring life back to the skin. Ideal for devitalised Skin Instants® displaying visible signs of ageing. Oxygenating and regenerating agent: Specific BR Oxygenating Complex. Anti-wrinkle and antioxidant agents: Grape Seed Oil, Green Anise Extract. Purifying and lightening agent: White Clay. Ⓒ 2018 BIOLOGIQUE RECHERCHE ALL RIGHTS RESERVED. ALL TRADEMARKS ACKNOWLEDGED.